Abdominal pregnancies often develop a tremendous blood supply from the organs next to the uterus and fallopian tubes. These pregnancies are generally thought to have originated as tubal ectopic pregnancies that were expelled from the tube into the surrounding abdomen (where they subsequently re-implant). 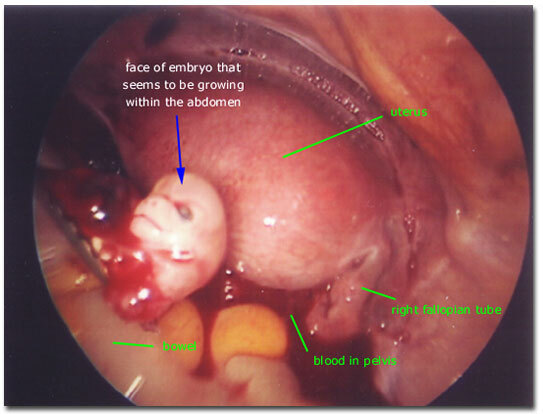 In this photograph, the fetus is seen freely floating within the abdomen at the time of laparoscopy. Initially, blood and blood clots needed to be evacuated in order to identify the location of the pregnancy. The fetus was removed and the placental site was found to be adjacent to (and involving) the left fallopian tube. Careful removal of the involved portion of the fallopian tube and surrounding broad ligament (mesosalpinx) allowed hemostasis to be assured throughout the performance of the procedure. It was not possible to determine whether the pregnancy was a ruptured tubal ectopic pregnancy (with a free floating fetus in the abdomen) or a true abdominal pregnancy. The ability to sacrifice the tube and mesosalpinx allowed removal of the entire pregnancy. If an abdominal pregnancy is suspected or diagnosed, tremendous care should always be taken to determine whether the placental site can be removed safely. If the surgeon cannot assure safe removal, the placental site can be left in place and this residual pregnancy can be treated with methotrexate (medical management).